I decided to play around with an image filter program I whipped up last week. It’s still very raw but the intentions are to have my own suite for making plug-in image filters that can be stacked up similar to audio filters work. I wanted a system that would work in a visual and intuitive way so I could experiment with digital art. Anyway, the point of this post is about some of the results I got from playing. I’ll talk briefly about each one because I think they’re really interesting. The image is called Shermech and was created by an amazing artist named FlyingDebris on deviantART. A. 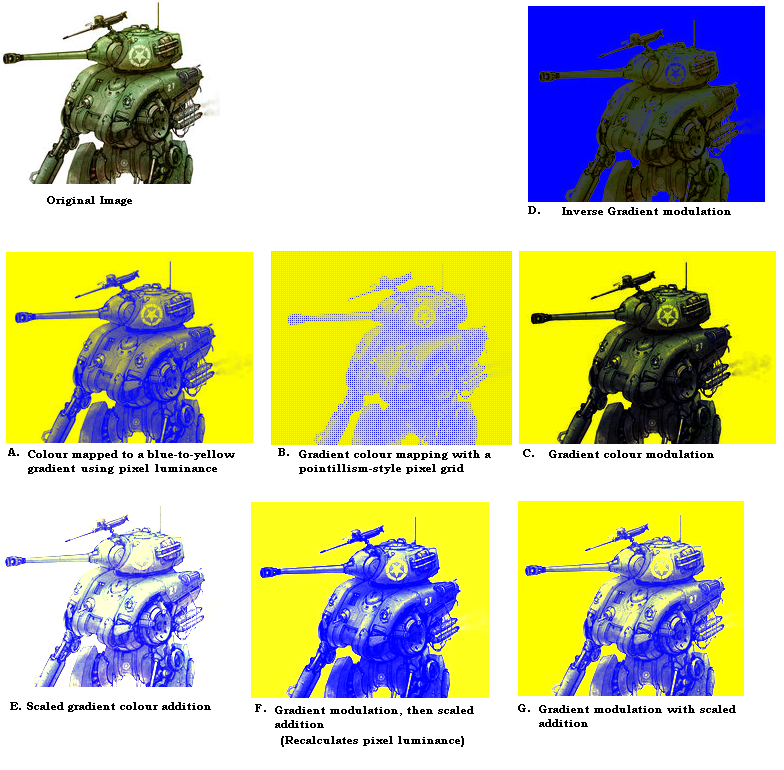 This uses a colour mapping from the image pixels’ luminance value to a blue-to-yellow interpolated gradient. B. Same as A. but only every other pixel is displayed to create an old printing or Pointillism effect. F. Gradient modulation, and then a scaled addition. This means the pixel luminance values will change between filters. G. Same as F. but the luminance values will not be recalculated between effects. Pretty cool. I guess this is all pixel shader stuff? Actually none of this is pixel shader stuff.